Gardening is a relaxing activity that many people enjoy. Perhaps, you grow vegetable plants to produce food for your table or have an orchard for fresh fruit. Consider adding another type of plant. Herbs have many practical homestead uses. And, flowering herbs for bees are a wonderful food source. Of course, being a beekeeper – I love adding plants to the garden that benefit bees. Flowering herbs can provide food for all pollinators, not just honey bees. Bumble bees, insects and butterflies love to visit herb gardens. Many herbs have simple flower styles that provide nectar, pollen or both. Choose herbs for bees that are also useful for home purposes. They can be used in cooking, healing and various beauty regimes. Growing herbs can seem a little overwhelming in the beginning. In part, this is because there are so many kinds to choose. 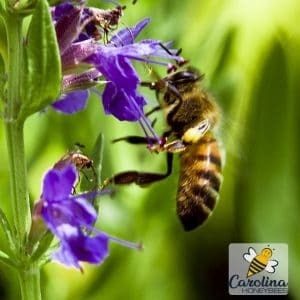 In addition, to flowering herbs that provide food for bees – you may choose other varieties that can be used on the homestead. There are many good herbal books and this one comes highly recommended. The internet is wonderful but I still love to sit down with a good book on occasion. Some herbs are more difficult to manage but many are easy to grow. They make great companion plants in gardens. And, some can even be grown in containers. This means that you can grow an herb garden just about anywhere. Herbs can be grown from seed and many are available as plant starts. Garden centers are a great place to shop for herbs. Check them out – especially in early Spring. 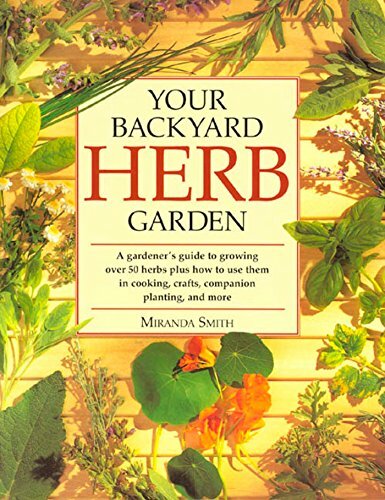 When choosing where to plant your herbs, consider the needs of the plant. Most are very forgiving in regards to growing conditions, but some require more or less sun or water. Anise hyssop (Agastache foeniculum) This herb is a herbaceous perennial. It loses it’s leaves during Winter but comes back each Spring. Anise hyssop spread by rhizomes under the soil. In my garden I grow a hybrid called “Black Adder”, it performs very well and blooms in late Summer. This is a time when many other nectar sources are gone. Bees, hummingbirds and butterflies are attracted to my plants. A member of the mint family, Anise hyssop is edible. Flowers and leaves can become a garnish on salads. Leaves and flowers can be dried and used to make a black licorice flavored tea. It is often used when treating colds. A relaxing bath can be made with the dried leaves of this herb. Place dried leaves in a cheese cloth bag or nylon hose. Let your bath water flow thru the bag while filling the tub. Basil (Ocimum basilicum) Basil is easy to grow outdoors during Summer. It is tender and must be planted after all threat of frost is gone. It likes a sunny location with well-drained soil. This is a great companion plant for tomatoes in your homestead garden. Bees love Basil and collect both pollen and nectar from the white to light-blue flowers. Basil does well during hot weather if properly mulched. It provides nectar and pollen when other sources may be scarce. Basil is another one of the culinary herbs. The leaves can be harvest and dried for storage. They can be used in many different kinds of recipes. Bergamot – Bee Balm (Monarda citriodora). Another summer blooming perennial, Monarda blooms from mid-summer until Fall. This herb grows in clumps with showy flower heads. Easy to grow, they can have problems with Powdery Mildew so good air circulation is important. There are several varieties of Monarda. Choose one that is suitable to your climate. Attractive to many types of bees, this herb provides nectar and pollen. Monarda is the herb that flavors Earl Grey Tea. Boiling water is poured on the leaves and let steep for 10 minutes before drinking. Borage (Borago officianlis) This annual herb is recognized by its beautiful blue flowers. Easily grown from seed, Borage grows to a height of 2 feet – give them room. Another great companion plant, it is known to repel pests like horn-worms. In the past, Borage was a major honey plant. Bees flock to the flowers to collect nectar. It is a real bee favorite. True to the idea of “Herbs for Bees and You” Borage has many uses. The leaves can be used as a salad green, in soups, sauces and even as a vegetable. It has a taste similar to cucumber and is used to flavor many types of dishes. Lavender (Lavandula spp) Lavender is another herbaceous perennial. There are 4 major varieties of Lavender and many hybrids. Be sure to choose a Lavender that fits your growing climate. Lavender likes a lot of sun but it can be grown in containers. Providing nectar and pollen, some of the best varieties for bees and butterflies are: “Lavance Deep Purple”, “Super Blue”, “Pastor’s Pride”, “Phenomenal” and “ Dilly Dilly”. There are many reasons to grow Lavender in your homestead herb garden. Lavender leaves can be mixed with mint to make an herbal tea. The most common use of Lavender is in the field of aroma therapy. Simmering lavender leaves in a pot of water releases a calm soothing fragrance. It can be added to numerous bath and body products. Lemon Balm (Melissa officinalis) Native to the Mediterranean. Lemon Balm is an aromatic, lemon-scented perennial. This herb will grow in most soils but will be larger with some shade. The genus name (Melissa) means honey bee. So, it comes as no surprise to know that bees love Lemon Balm. A fresh Lemon Balm leaf can be added to your glass of iced tea. It is also used in salads, salsa or chicken dishes. Lemon Balm leaves are harvested and dried for year-round use. They are used to make herbal teas, tinctures or ointments. Thyme (Thymus spp) No garden of herbs for bees (and us) would be complete without Thyme. A perennial herb that is easy to grow and requires no fuss. Some varieties are shrubs and other types of Thyme become ground-covers. It loves hot sun and doesn’t require a lot of moisture. Thyme can even be grown in containers and gives off a wonderful smell. Bees seem to like all varieties of Thyme. If fact, you will also see bumblebees, butterflies, wasps and other insect pollinators visiting your garden. Because this herb attracts bees, you should have better pollination in your garden. A welcome addition to any well-stocked pantry, Thyme is mostly used in cooking. Every part of a meal from Soup to Dessert can feature this herb. This article on Natural Living Ideas has some great ideas on Using Thyme. 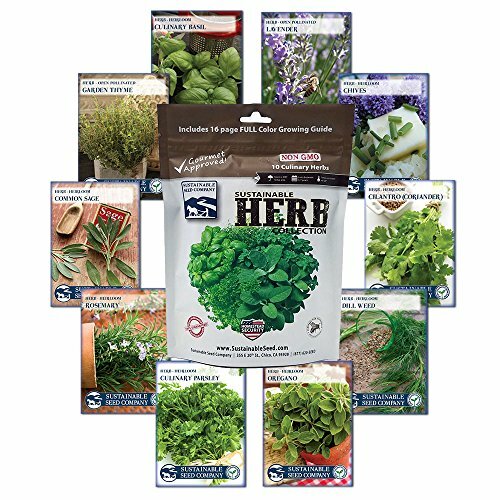 If you want to try a variety of herbs, consider this herb selection from Sustainable Seed. They have a stellar reputation for providing good quality non-gmo seeds. This collection contains several of the flowering herbs mentioned in this article. Planting herbs for bees results in attracting pollinators to your other garden plants. It’s a win-win situation. Choose multi-purpose plants for your homestead garden. This is an efficient way to make the best use of your time and space. Choose weed killers with caution and use the least toxic formulas. Whether you have a large space, or a small container garden, you and the bees can share and enjoy the benefits of planting herbs.